Need a florist to send gorgeous flowers from Canada to Sydney, Australia? Pure Flowers is here to help! 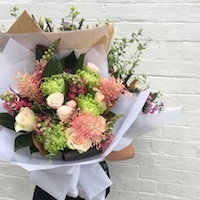 We deliver beautiful blooms from our award-winning florist anywhere in Sydney. Need to send flowers to Sydney from Canada? Pure Flowers is here to help. You can order beautiful flowers from Vancouver, Ottowa or anywhere in between. We hand-select the freshest blooms from the Sydney Flower Market to create stunning bouquets, luxury rose boxes and Australian native arrangements. Our florist delivers quality flowers from our flower shop to anywhere in Sydney. Place your order by 11am weekdays and 9am Saturdays, Sydney time, for same day delivery. Ordering is easy – shop online or call + 612 9427 8214. Pure Flowers is an award winning boutique florist. Our talented and friendly team, delight in creating unique designs to help you celebrate life’s special moments. We have a fabulous selection of flowers for you to choose from - amazing bouquets, Luxe rose boxes and florals in a vase. Whether you call or buy your flowers online, our team will design your order in our floral boutique. Read our flower care tips so that flowers can be enjoyed for longer in the home, office or school. Do you like DYI projects? View our guide to creating the best party flowers for any occasion.